In just a few short weeks, we at Mytee Products will begin seeing an influx of truck drivers coming in to stock up on tarps in preparation for the winter. Many of our customers have been driving trucks long enough to know exactly what they need. Others, might not be so sure of what they need to buy – especially if this is their first winter on the road. We believe the best way to assemble a collection of tarps is to ask the five questions posed below. These questions help truck drivers better understand what they need, covering everything from standard steel to canvas tarps. 1. How do different tarps vary? We carry a range of vinyl and canvas tarps in different shapes and sizes. We don’t do so simply because we like variety. It turns out that each kind of tarp has its own unique purpose. As for vinyl and canvas, the two materials have their strengths and weaknesses. New drivers should do a little research to learn about coil, steel, lumber, smoke, and machinery tarps. They should also educate themselves on the difference between vinyl and canvas. Once a driver knows all the differences, he or she can evaluate what is necessary to get through winter. 2. Which tarps best suit my needs? Driver needs are as varying as the loads they carry. A driver who earns most of his or her living carrying loads of steel coil will probably invest mainly in those two kinds of tarps. Another driver who concentrates mainly on lumber will invest heavily in lumber tarps. Most drivers don’t have the luxury of focusing on a particular type of cargo, though. Therefore, they have to carry a selection of different tarps on board. 3. How will a particular tarp perform? There is always the question of how a particular tarp might perform if used to cover cargo for which it was not originally intended. For example, consider a driver who focuses mainly on lumber. If he were to accept one or two machinery loads every year, would those lumber tarps in the toolbox still perform well? The idea here is that while a variety of tarps are usually recommended, a driver does not need to invest unnecessarily if some of the tarps in the box can be multi-functional. 4. What sizes do I need? Truck tarps come in a variety of sizes to accommodate different loads. We know drivers who purchase only the smallest tarps because these are the easiest to use. They would rather deploy multiple smaller tarps then wrestle with bigger ones. But that’s all driver preference. If you want to invest in tarps of multiple sizes, purchase an equal number of all. 5. Do I know how to care for tarps? Last but not least is the pesky question of caring for truck tarps. Although truck tarps are generally not high maintenance items, they do require a certain amount and type of care if a trucker wants to get maximum life out of each purchase. It should be noted that caring for canvas tarps is different than caring for vinyl tarps. There are also different ways to repair tarps depending on the material used. Autumn is the season when we see a lot of truck drivers stocking up on their tarps ahead of winter. If you need to bolster your inventory, Mytee Products has everything you need. From vinyl steel tarps to heavy duty canvas tarps, you will find everything you need to complete your inventory here. Feel free to order online or, if you’re ever in the neighborhood, visit our Ohio warehouse. Driving down the interstate you will notice trucks of all shapes and sizes carrying cargo. You’ll see dump trucks carrying stone or gravel, semi-tractors hauling fully enclosed trailers, and flatbeds carrying loads covered with tarps. Tarped loads are diverse as well. So what determines what type of load a driver will accept? Company drivers do not have much say in the matter, but independent drivers get to choose what they haul. Loads requiring tarps also require special consideration before drivers will accept them. The nature of truck tarps means there are pros and cons drivers have to consider. Using truck tarps requires different knowledge and skill than loads contained in dry-van trailers. They require more time to secure. The driver has to make sure the tarp is secured with bungees in a way that protects the load, the tarp itself and generally meets all safety requirements. As such, tarped loads often pay more, making them more attractive to drivers who do not shy from the exertion. Commodities like Steel coils, lumber and shingles cannot be loaded on to Dry-Van trucks, not easily anyway. Oversize loads cannot go in Dry-Van trailers either. If one requires such loads to be hauled, Flatbed is the only Industry accepted option. Once such a load is accepted, the driver is responsible from the moment of pick up to the moment of drop off. If a tarp can be deployed to prevent water, stone-chip and other damage to a load, it may be well worth it. There are plenty of reasons why a driver might prefer to avoid tarped loads, beginning with the cost. The truth is that truck tarps are expensive. However, a high-quality tarp will pay for itself after just a couple of loads. Drivers who take care of their tarps know they can last for years. Perhaps the biggest disadvantage of using truck tarps is the fact that they are heavy and difficult to deploy correctly. A tarp must be secured in such a way as to protect both the cargo and the tarp itself. There must be no flapping in the wind either, as that can damage the tarp to the point of making it unusable. And of course, deploying a tarp can be injurious to one’s health. It only takes one fall to cause major problems. Advances in technology have made it possible to deploy truck tarps using motorized winch systems with automatic spreader bars. This allows the truck driver to deploy the tarp from the safety of the ground, all but eliminating the risk of injury by way of falls. An added benefit of these systems is the ability to deploy a tarp evenly across the entire surface of the load. However, it still takes time that could be put to better use on the road. Automated systems are limited to pre-set load types and sizes. They can also be expensive. Thus far, we have talked about tarped loads as they relate to independent drivers. However, what about companies that operate their own fleets? There is a certain amount of liability that comes with using truck tarps – liability that involves both drivers and cargo. Companies go to great lengths to protect themselves through proper training, fall restraint systems, and other safety accessories. It is true that tarping is a necessary part of the trucking industry. It is also true that drivers can make more money when accepting tarped loads. Nevertheless, like anything else, both the pros and cons need to be weighed before deciding whether to accept loads of a given type or not. That’s just part of the business. Do Truck Tarps Really Save Gas? A test done in the late 1990s to determine if gas was being wasted by open pickup truck beds resulted in the conclusion that adding a tarp or tonneau cover could significantly reduce drag and increase gas mileage. That study was seized upon by cover makers who suddenly found an entire market of customers willing to buy their products. A similar study was conducted 10 years later, reaching the same conclusion. However, we wonder whether these glorified tarps for trucks really do save that much gas or not. Let’s be honest; long haul truck drivers use flatbed truck tarps on their trailers to protect the cargo. They are not being used to reduce drag or save on gas. Even dump trucks that make use of tarps do so to prevent the cargo underneath from coming loose in the wind and striking unfortunate passenger vehicles. These are not used to save gas. Yet pickup truck drivers seem to be stuck on the idea that a tarp or tonneau cover is more fuel-efficient. The original numbers used to justify truck tarps and tonneau covers came from the Specialty Equipment Market Association (SEMA) and their two tests we previously mentioned. However, other tests have been done, one most recently by Consumer Reports, which casts real doubt on the idea of improving mileage with tonneau covers and tarps for trucks. The problem with the SEMA studies is that they only looked at drag and aerodynamics. They never actually tested any vehicles under real world conditions, including measuring how much fuel was used at different rates of speed. They simply assumed that by reducing drag, fuel mileage would increase. That makes sense, right? It turns out it’s probably not true. The results of the Consumer Reports test startled many pickup truck drivers. Why? Because putting a tonneau cover or tarp on the back of a pickup truck appears to actually decrease fuel mileage pretty significantly. The magazine didn’t explain why, they just provide the raw data; data that showed covering the back of your truck actually make things worse in terms of gas mileage. Now that we have completely ruined your day by telling you tonneau covers and truck tarps do not save gas, we don’t want you to assume that they do not have any value. They do. Tarps can be very useful for a number of things, whether you drive a pickup truck, a dump truck, or a semi. For example, a tarp on the back of your truck is a great way to protect cargo underneath from sun, rainfall, and flying debris. Truck drivers use them all the time to protect valuable cargo until they drop a load. And of course, you might use them with your own pickup truck when you’re moving your house. Tarps are also valuable for protecting other drivers from your cargo. At highway speeds, things can come loose a lot easier than you might think. A tarp keeps everything intact so that you are not endangering the welfare of others. Tarps for trucks do have their place. A place that is just not gas mileage improvement. Goods that are transported on a flatbed trailer always have some or the other kind of risk associated with them. The transporters or the truck drivers worry about the protection of the goods from different on-road challenges. They also have to make sure that the goods do not fall off from the trailer when they travel at high speeds on highways and rough paths. Truckers use many accessories to make sure that their load is secured and one of the most important of all accessories will be trailer tarps also known as tarps for trucks. These tarps are multipurpose products and can be used to cover and protect all types of material that is been transported by truckers, be it food products, metal products, construction work products, heavy machinery, lumber, and all other form of cargos. There are new technologies being implemented to manufacture the tarps that are sturdy and can be used for a longer period of time. Steel tarps are appropriate to cover metal products and are made of heavy duty vinyl material. These tarps protect the metal cargo from inclement weather and keep them from corrosion and rust. The other type of truck tarp is a lumber tarp. Lumber tarps are generally used to cover tall loads of lumber and are also made of high quality vinyl material. These tarps are specially designed to protect lumber and have 6ft to 8ft drop so that cargo is completely covered and protected. Covering the cargo with such tarps will ensure that your cargo remains in place and protected from external elements while it is been hauled to cover long distance. Then there are mesh taps available in the market. When truckers transport different types of material it is not necessary that all kinds of materials need protection from the rain, snow and other weather conditions. Materials like gravel, asphalt, sand and small rocks do not need weather protection but the truckers still need to cover such loads so that the objects do not fly and disturb other drivers on road. Mesh tarps are best for covering such materials. Trucking industry takes a huge share of market in the whole transportation industry. If the goods are delivered in sound position to its destination, it is because the truckers take extra precaution in protection of the goods with tarps and other accessories. Tarps for trucks protect goods from external environments and hold them in position to prevent loads from falling off the truck. No doubt these tarps are important for the truck drivers. Tarps are used in the transport industry since decades now to cover the loads while being hauled by the truckers. But what do these trailer tarps for trucks do for the truckers? And how are they beneficial to the transporters? Lumber Tarps – Lumber tarps are basically used to cover the lumber on a flatbed trailer. These tarps are made of heavy duty vinyl material and are able to protect the cargo from inclement weather and damage. These types of tarps are specially designed to cover tall loads of wood on a trailer. Steel Tarps – Steel tarps are also made of heavy duty 18 oz vinyl material as they are particularly intended to cover and protect steel products like wires and sheets. Steel tarps keep the load free from corrosion and rust. Mesh Tarps – Mesh tarps allow some amount of air and moisture to pass through it so these tarps are used to cover the material that needs tie down but is not affected by the weather conditions. Materials like gravel, small rocks and sand can be covered by these tarps. 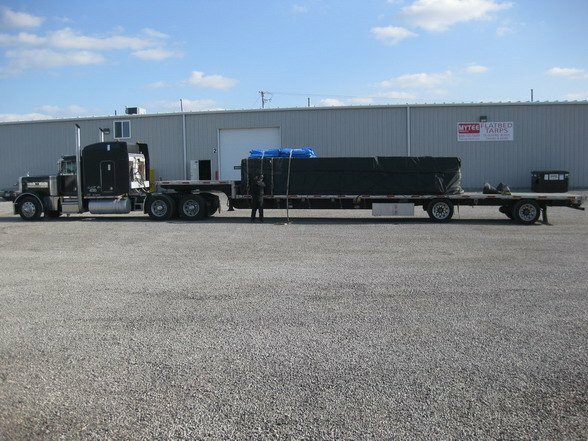 Protection – Tarps are able to protect the cargo on a flatbed trailer from all types of external elements. Cargo which is loaded properly on a flatbed trailer and covered with appropriate tarp will remain in place over a long distance journey, passing through different weather conditions and rough routes. Much of the worry of the truckers is reduced by securing their cargo by a tarp. Safety and security – Truckers have the responsibility to deliver the cargo undamaged to its destination. They face harsh weather condition, uneven roads and other type of challenges while they are hauling a heavy duty cargo. Trailer tarps are the perfect solution for the truckers as they come in many varieties and also in different types of dimensions. Truckers can always find a tarp that suits their load type from so many options available for safe transportation of goods. All in all tarps or tarpaulins are very useful and important hardware for truckers. It doesn’t matter what type of cargo you haul, but it is important to use a tarp to secure it for your and other motor drivers’ safety on roads.